There are many forms of nature-based spirituality. Some people choose to follow initiatory pagan paths such as wicca or druidry, other prefer to find their own ways to connect with nature. Earth Wisdom by artist, healer and teacher Glennie Kindred is aimed at those who perhaps don’t want to sign up to any structured pagan religion, but nevertheless want to celebrate the changing seasons and honour the Earth in harmony with the phases of the moon and cycles of the sun. It shows how to do this in a way that is spiritual, but not overtly religious. It is a lovely book, with gentle words and delightful pictures, that takes the reader on a journey to meet the spirits of the land, the plants and trees. It begins by explaining that all things are connected; that we are part of nature and can affect change on our environment. Publisher Hay House says on its website: "This beautiful and inspirational guidebook from Glennie Kindred teaches us how to work with the natural cycles of the year. Comprehensive and accessible, it is an invaluable source of information for anyone wanting to learn more about tree lore, Celtic festivals, the five elements, Moon energies or simply how to make a deeper connection with the Earth." Although it is aimed at beginners, plenty of those who already have some experience of paganism will still be able to learn a thing or two from this book. Sections explaining such things as how to meditate, how to dowse and how to do traditional crafts including broom-making and willow-weaving are interspersed with chapters on lore associated with trees. The trees Glennie concentrates on are those associated with the Ogham – an early Irish system of divination and communication using the symbolism of different types of wood, that is also used by today's druids. Through learning about trees and their mythology, symbolism and healing properties, we can become both more aware of the living world around us and connect with the beliefs of our ancestors. The second half of Earth Wisdom takes the reader through the Wheel of the Year - the cycle of festivals for spring, summer, autumn and winter, including such things as Samhain and the Winter Solstice, that most modern pagans follow. The book suggests seasonal celebrations, suitable for people of all paths and faiths, and also ceremonies to connect with the Earth in a more spiritual sense. But Earth Wisdom is more than just a lovely beginner's guide to nature spirituality, it is also a call to awaken our awareness of environmental issues. It reminds us that we can each help to protect the natural world we live in through our words, our deeds and our beliefs. Hay House says on its website: "Our relationship to the Earth has changed. We have become more aware of how our actions can affect the balance of nature. 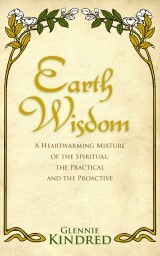 Earth Wisdom is a potent reminder to appreciate the natural vitality, unity and intelligence of all life... This book inspires us to restore our own connections to the Earth, encouraging us to follow our own personal spirituality and intuitive wisdom. In so doing, it increases our potential for creating positive change in our lives and in the world!" Earth Wisdom has just been released as a new edition by Hay House and can be ordered through Amazon, where you can also download the Kindle edition.